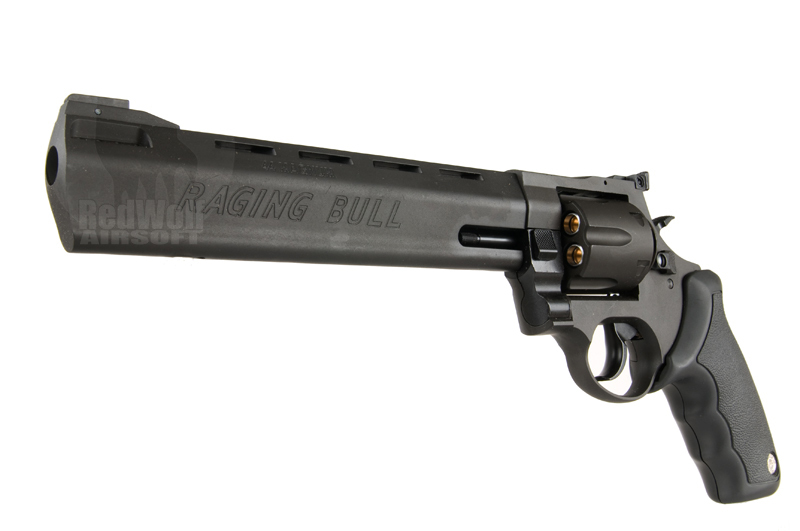 The Raging Bull is a large revolver manufactured by Taurus for use as a hunting sidearm due the enormous stopping power of its available calibers. 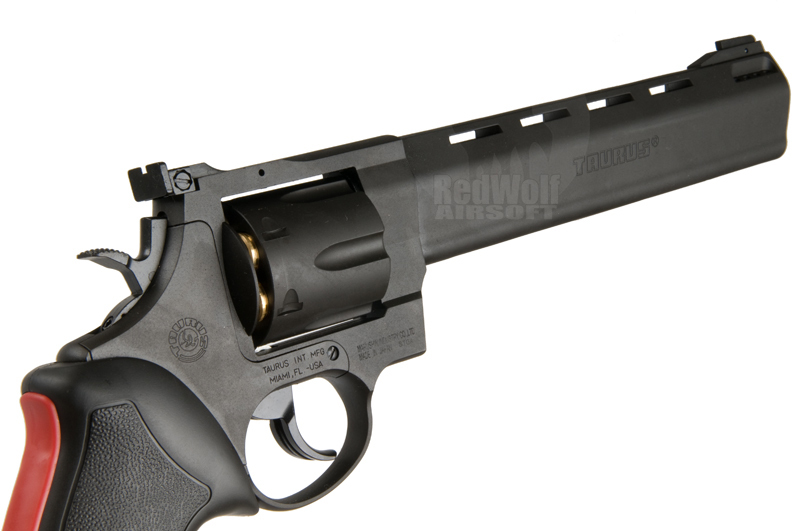 In particular, the .454 Casull version has been known to take down Cape Buffalo and even Elephants. 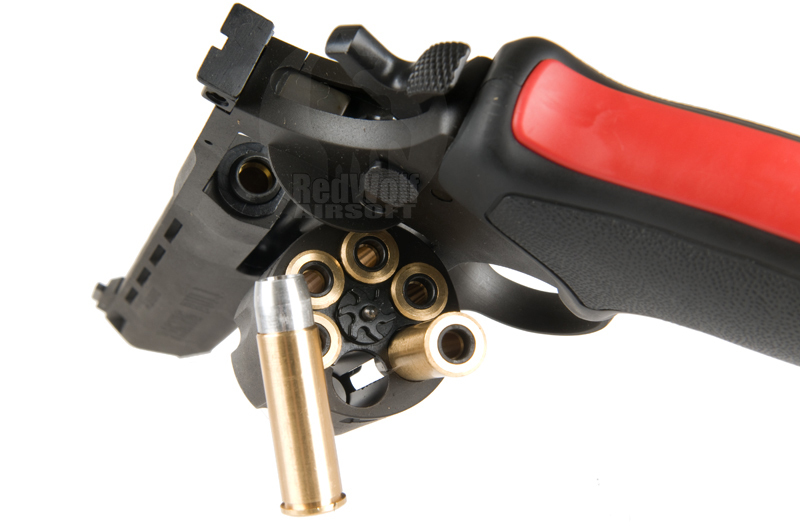 The Raging Bull has a thumb ported barrel and a red rubber strip along the back of its grip, which cushions the shooter's hand and lowers perceived recoil on the real thing but is little more then an aesthetic flourish on the Marushin version. Functionally, the Raging Bull has a manually operated front cylinder latch, whose release can be seen on the crane. Front cylinder latches are required for the real high powered double action revolvers, and are found on the Ruger Super Redhawk and the S&W M500 but they are actuated by the rear cylinder latch. The manually operated latch on the Raging Bull is simpler (and thus less expensive to produce) yet equally strong but requires two hands to open the cylinder. 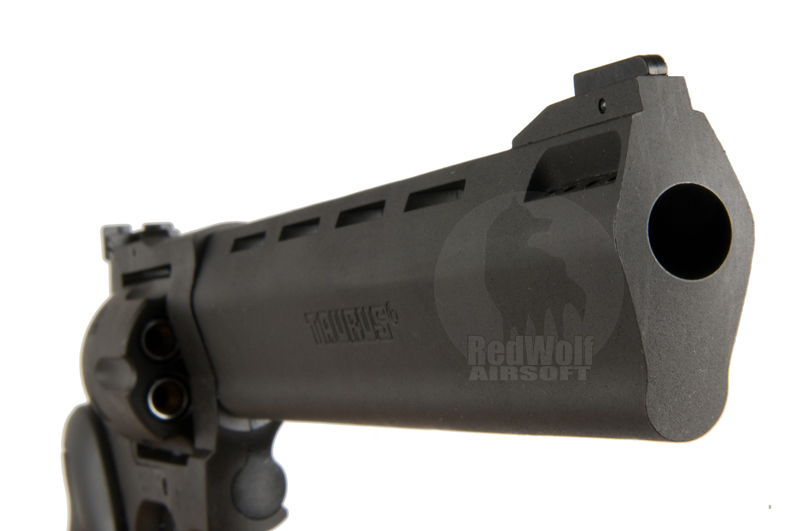 The power factors do not come into play in Airsoft but the recreation of the real steels functions is a testament to Marushins eye for detail. The Marushin X Cartridge series loads six full sized dummy shells into the chamber; each shell containing a single 8mm BB. The gas reservoir in the pistol is charged via the standard valve on the bottom of the grip; there is more then enough gas to empty all 6 shots, each one clocking in at around 220 fps making it a solid powered revolver.